Stephen Hawking delivers a speech during a lecture honoring NASA's 50th anniversary in 2008. Hawking died March 14 at the age of 76, and hundreds of people attended his March 31 funeral. 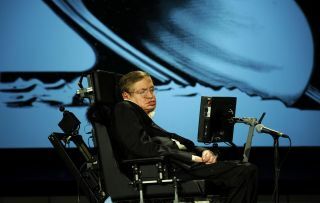 Hundreds of people celebrated the life and legacy of Stephen Hawking at the famed cosmologist's funeral Saturday (March 31). Hawking's family invited about 500 people to the ceremony, which took place at Cambridge University's Great St. Mary's Church, according to NPR. Among the folks who paid their respects was actor Eddie Redmayne, who portrayed Hawking in the 2014 film "Theory of Everything." Hawking's ashes will be interred later this year at London's Westminster Abbey, which also houses the remains of Isaac Newton and Charles Darwin, among many other notable people. Stephen Hawking asked, and attempted to answer, big questions about the cosmos and its evolution. For example, he and British physicist Roger Penrose posited that the universe emerged from a singularity, a point of infinite density akin to the heart of a black hole. And Hawking showed that black holes likely aren't entirely black — that they actually emit radiation and therefore eventually evaporate, given enough time. Hawking also helped bring cosmology to the masses, writing best-selling books such as "A Brief History of Time" and "The Universe in a Nutshell." And people around the world were inspired by his personal story: Hawking accomplished all of this while coping with Lou Gehrig's disease, which robbed the physicist of most of his motor function over the years. Hawking was an atheist, but he did his graduate work at Cambridge and was based at the university for decades thereafter. So, "because of his deep ties to Cambridge University, his family chose the customary Church of England service given to longtime fellows here," NPR reported.